General Hospital (GH) spoilers tease that one soap star and his wife are adding to their brood. Drew Cheetwood isn’t around much as Milo in Port Charles these days. That’s a bummer for GH viewers, but we can hold out hope for more appearances eventually. Cheetwood may even appreciate having more time to focus on his family right now. It turns out that family’s about to get a bit bigger! 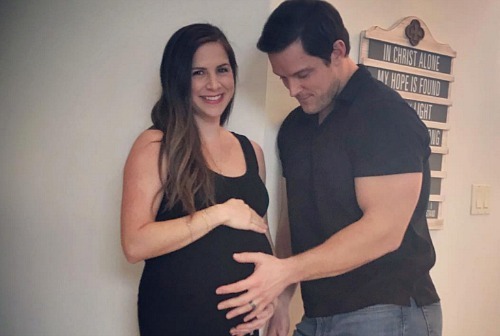 In a recent Instagram post, Cheetwood had some great news for General Hospital fans. Cheetwood’s married to Jenna Vitale and they already have two little girls. They announced that they’re about to add another kid to the mix. Cheetwood posted a sweet photo of Vitale, who’s sporting quite a baby bump. He posed next to her as they filled everyone in on their impending bundle of joy. The couple didn’t reveal the baby’s gender, but they’ll undoubtedly be happy no matter what. Their daughters will should enjoy having a new brother or sister as well. This family has every reason to be on cloud nine! In the caption, Cheetwood offered a quote from Shakespeare. He posted, “Once more unto the breach, dear friends, once more.” Dozens of comments poured in to congratulate Cheetwood and Vitale. Everyone’s hoping the rest of Vitale’s pregnancy will go smoothly. They’ll most likely provide updates as the birth draws near. Some soap stars are more private than others, but Cheetwood often posts pics of the of the fam on social media. That probably means we can expect a photo of this little one once he or she is born. Many GH fans will check back to see this cutie down the road. As for what’s next in Port Charles, General Hospital spoilers say the action will heat up without Milo. The show doesn’t have any comeback plans for him right now, but we’ll keep you posted. Fortunately, there’ll be plenty of other characters to fill up PC and bring all the drama. What do you think about Cheetwood and Vitale’s upcoming addition? Would you like to see Milo back on General Hospital? Stay tuned to ABC’s GH and don’t forget to check CDL often for the latest General Hospital spoilers, updates and news.